The second pair of Japanese spy satellites, destined for a reconnaissance mission to observe the activities of North Korea, was destroyed today during a failed launch aboard the H-2A rocket. 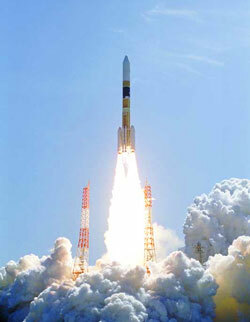 The secretive launch began at 0433 GMT (11:33 p.m. EST Friday) from the Yoshinobu complex at the shores of Japan's Tanegashima Island spaceport. About 11 minutes later, however, the ground personnel sent the rocket a command to destruct when it became clear the vehicle was not going to reach orbit. Engineers announced several hours after the incident that one of the two Solid Rocket Booster-A's, the large motors strapped to the first stage, did not separate properly during the launch. 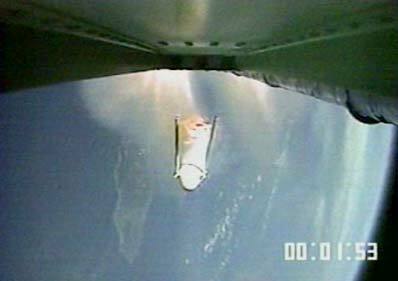 The white boosters -- 15 meters tall and 2.5 meters in diameter -- provide added thrust during the initial 100 seconds of flight, then jettison at approximately T+1 minute, 50 seconds to fall into the Pacific Ocean. With the extra weight from the spent booster still clinging to the rocket, the H-2A was unable to reach the necessary velocity and achieve a successful orbit around Earth. The Japanese Aerospace Exploration Agency has formed an accident investigation team led by President Yamanouchi to determine what caused the booster's failure to separate. According to the Kyodo news agency, the rocket was at an altitude of 422 kilometers and ascending over the Pacific north of Indonesia when it was ordered to break apart. Prime Minister Junichiro Koizumi said in a comment released in the afternoon, according to Kyodo, "It is extremely regrettable in such a situation where our nation needs to boost its information-gathering ability for security reasons and to prepare for natural disasters. We will probe the cause quickly, strictly and completely, and consider further response (to the failure)." Before the mishap, the H-2A had a successful record of five flights in two years. The rocket has two liquid hydrogen- and liquid oxygen-fueled stages and can be fitted with a varying number of strap-on solid motors for additional lift. The upgraded H-2A vehicle replaced the troubled H-2 rocket in 2001 after a series of costly launch malfunctions. This mission was delayed from September 27, when a technical issue arose in the final countdown. The glitch with the rocket's second stage inertial measurement unit was repaired by adding parts such as diodes and a resistor into the component, said Junichi Moriuma, spokesperson for the Japanese space agency JAXA. The two spy craft lost -- one bearing optical observation instruments and the other with radar imaging capability -- were to join another pair launched into orbit March 28. Officially dubbed "Information Gathering Satellites", the satellites were built to operate at least several years to chiefly monitor North Korea, Japan's principal threat in the region. The first two satellites deployed have been readily observed by amateur astronomers worldwide since their launch eight months ago. These observations have allowed experts such as Canadian satellite-watcher Ted Molczan to calculate orbital elements and predict when the craft will pass over certain parts of the planet. They operate in tandem and pass near North Korea during the late morning and late night hours each day, including a pass directly over the capital city of Pyongyang at 11:22 a.m. local time every four days. Both spacecraft orbit at 492 kilometers in altitude and the radar satellite leads the optical bird by about 37 minutes, according to Molczan's calculations. The new duo was believed to have been headed into an afternoon orbit that would "effectively double the number of imaging opportunities each day," Molczan told Spaceflight Now. The optical imagers could have a black-and-white resolution of up to about one meter, about the same quality of data available from commercial Earth-watching satellites. For nighttime and poor weather observations, two other spacecraft are fitted with synthetic aperture radar technology that can discern objects in almost any conditions with a resolution of about one to three meters, according to the Federation of American Scientists. Unlike the March launch, this encore event drew little fanfare leading up to the flight in the form of statements by North Korea. Earlier this year, the communist nation called the development of Japanese spy satellites a "hostile act" and said that it "heightened the vigilance" of North Korea. Under consideration for almost a decade, the $2 billion program was formally approved in 1998 just months after North Korea shot a Taepodong ballistic missile over Japanese territory in August of that year. Until the United States informed the Japanese government of the event hours later, officials reportedly had no knowledge of the missile launch. At the time, Japan simply relied on intelligence provided by other governments and on imagery produced by commercial remote sensing satellites. 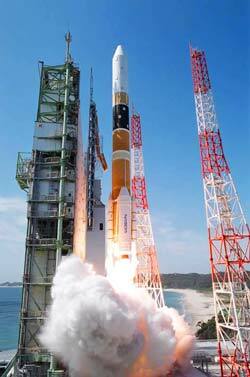 The belief held by Japanese officials is that a domestically-operated intelligence agency with its own space assets will cut down on the information gap on the activities of potential threats. The program immediately drew criticism both internationally and from within Japan. North Korea sharply denounced the production and launch of such spacecraft, and some Japanese critics said such a system violates a 1969 resolution banning military usage of the final frontier by Japan. The government responded to those critics by saying the quartet could be used for peaceful applications such as weather observation and disaster planning. The next H-2A mission had been scheduled for early next year to place the Multi-functional Transport Satellite 1R into orbit. How tonight's failure will impact that upcoming launch is not yet clear. Built by Space Systems/Loral, the MTSAT 1R spacecraft will be used by Japan's Ministry of Transport for air traffic control and weather observation. It replaces the MTSAT 1 that was lost during a failed launch of an H-2 rocket in 1999.